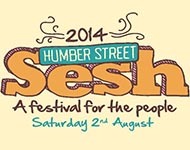 We’re playing Humber Street Sesh again! We are delighted to announce that we have once again been invited to play at The Humber Street Sesh one day festival, on Saturday 2nd August. Just about every band and performer in the Hull and East Yorkshire area applies to play here, so to find ourselves as one of the 180 “elite” acts is great! Details of where we are playing, and at what time, will follow soon. Oh, and Mark has promised not to get so drunk this year!